Networking is very powerful area which allows different machines to get connected. Human life became very easy through the networking concepts. Lets start the discussion of the same with understanding basics of the Networking & How to do it in JAVA. Networking allows communication between 2 or more computers. The diagram shown here is just for example to get an idea of how networking is done. Only one Server & 8 Clients are shown in the diagram. 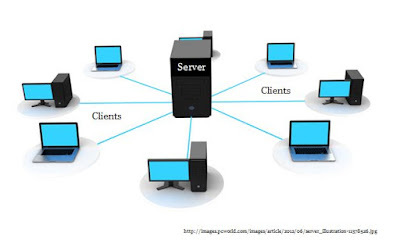 Clients makes requests to Server & Server serves those requests. In the last post we learned what is & how to use Multithreading in JAVA. The next ideal task to learn is how to use multithreading for Animation or how to use Multithreading in Applets. 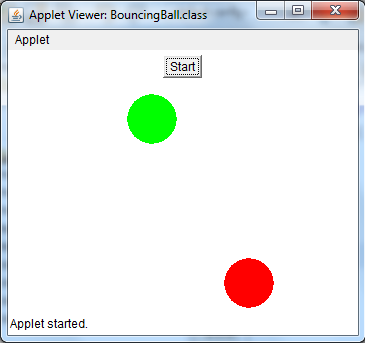 Today we will discuss program of Bouncing Balls in Java by using Multithreading and Applet. I am going have a button to start the Balls from one point in the Applet window. We need Applet class, AWT class to perform this particular task. After learning How to perform Multithreading in Java, the next step is to learn the same by using Runnable Interface. As explained in earlier post (Multithreading in Java) a class needs to extend Thread Class to achieve Multithreading. But when we want to do the same by using Runnable Interface, we must understand that Runnable is a interface not a class. JAVA is a very powerful language which supports many features. Multi-threading & Graphics programming are only few of them. Today, I am going to discuss a very simple program to explain both these concepts. Also I will share code with you on this post as well as on my GitHub account. Lets start the discussion with Multi-threading. Multi-treading allows programmer to use computer's resources in a very efficient manner. A Multi-threaded program is one which contains 2 or more parts that can run concurrently. Each part of such program is called a Thread & it defined the separate path for execution. Now a days all modern Operating Systems supports Multitasking. Multi-tasking is basically divided into two types: Process Based & Thread Based.